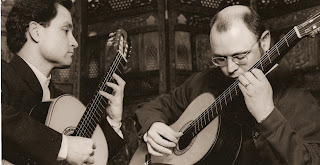 Come see the Portland Guitar Duo in concert at the Cedar Mill Community Library on Friday, September 16th, at 7:00 PM. Formed in 1999, the Portland Guitar Duo, James Manuele and Foti Lycouridis, share a mutual enthusiasm for the medium. Their repertoire covers the Renaissance, Baroque, Classical, Romantic and 20th Century periods and is performed on original, authentic guitars from the 1800s that have been restored to playing condition. Born in California, James Manuele began playing the guitar at age eleven. He earned his Bachelor of Music degree at Mansfield University, where he also studied voice and viola. Later, he earned his Masters of Music in Guitar Performance at Portland State University and currently teaches at both Clark College in Vancouver and at Concordia in Portland. Foti Lycouridis was born in Egypt of Greek parents. In 1981, he started his music education at the University of Portland. He holds a Bachelor's degree in Guitar Performance and a Master's in Music Theory. He also performs on 19th c. guitar, 10-string guitar and Baroque lute.